Oliver here. I’m taking on the Friendly Fill Ins this week. 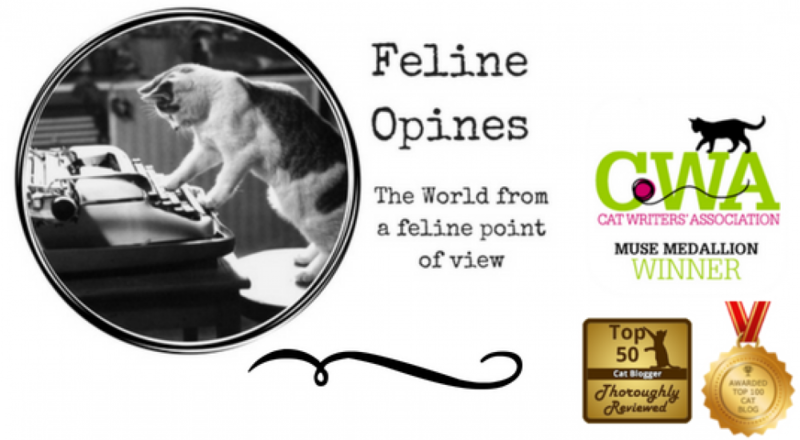 I hope you enjoy my answers and I invite you to purrticipate in this blog hop by going to 15andMeowing or Four-Legged Furballs the hosts of this blog hop. You are also welcome to opine about your fill in answers on this blog post. 2. Given the choice of _______________ or _______________, I would pick _________________. 1. One can always count on me to find and hog the best source of heat. The kitchen heat vent is my purrticular favorite. 2. Given the choice of snuggling with a human or snuggling with one of my feline siblings, I would pick neither and snuggle alone on my favorite down blanket. 3. Snuggling in my felted cat bed makes me feel warm and cozy. 4. I never go a day without guarding the house and snoopervising what’s going on in the woods around us. Here I am watching for leaves to chase. It’s a hard job but some feline has to do it! This entry was posted in cat behavior, Cat blogs, Cat writers, cats, Pet blogging, shelter cats, Top 50 Cat Bloggers and tagged cats and blankets, cats and heat vents, Feline Opines, felted cat beds, Oliver, snoopervising by Feline Opines. Bookmark the permalink. You are very wise, Oliver. Very wise. You do these fill-ins very nicely too. Warm and snuggly is always so darn good! A comfort seeking fellow you are, Oliver! Cozy is good. I bet that kitchen vent feels HEAVENLY! You are a master snuggler and guardian in charge of leaf invasion prevention. Have a blessed Sunday and week! Oliver, you’ve got it all covered! Oliver, we love seeing pictures of you and your adventures.